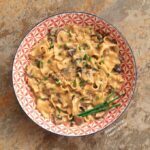 One-Pot Vegan Mushroom Stroganoff is sheer, creamy (but dairy-free!) comfort-food goodness. 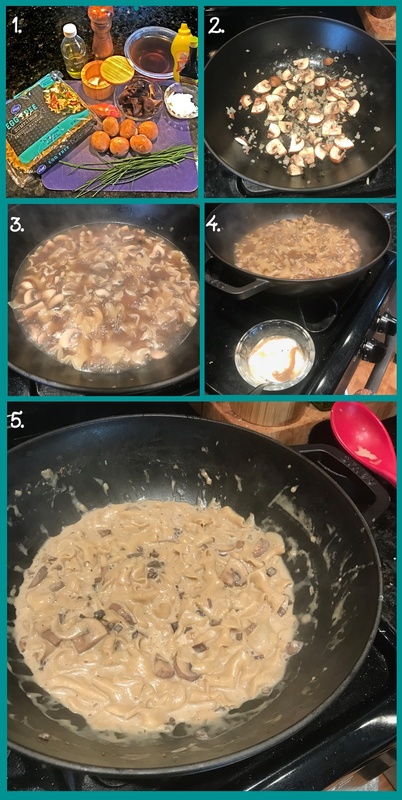 For my latest Veganuary installment, I decided to go with a one-pot wonder: One-Pot Vegan Mushroom Stroganoff. The pasta is wonderfully creamy, but without any flour or dairy. This dish has actually been on my to-do list for quite some time—ever since I posted One-Pot Ground Beef Stroganoff. Veganuary seemed like the perfect time for the vegan version to make its debut on the blog. It’s also -10º F outside right now. Emergency comfort food, STAT! One-Pot Vegan Mushroom Stroganoff is loaded with earthy, umami, mushroomy flavor. This is because it incorporates a healthy dose of not only fresh mushrooms, but also rehydrated mushrooms. AND the liquid used for rehydrating said mushrooms. Plus, I use a porcini-infused extra virgin olive oil (but that’s optional). Many beef stroganoff recipes call for Worcestershire sauce. But I rarely use it because I think it’s nasty. It’s not vegan: WS is made from fermented anchovies—as a non-vegan, I’m okay with that (I use Asian fish sauce in many of my non-vegan dishes). What kills it for me, though, is a funny wang from tamarind that I don’t care for at all. Sour cream, obviously, is not vegan. But there are plenty of commercial vegan sour cream products out there (or easy recipes for making it yourself: I’ve even linked one up in the recipe below). This recipe begins with rehydrated mushrooms. So, you need to plan ahead and do the rehydrating in advance. It takes about 45 minutes, plus straining and chopping the mushrooms. Also, if you’re planning to make your own vegan sour cream, be advised that you’ll have to soak cashews overnight. You can clean and slice the mushrooms and chop the shallots in advance as well. First, heat the oil in a heavy-bottomed pot or skillet over medium heat. Add the cremini mushrooms and shallots. Sauté until the shallots are translucent and softened, 5–7 minutes. Next, add the rehydrated mushrooms, thyme, black pepper, and salt. Sauté for one minute. Add the pasta and the vegetable broth. Bring to a boil, then reduce the heat and simmer, covered, for 10 minutes. Make sure to stir occasionally to keep the pasta/sauce from sticking to the bottom. After 10 minutes, uncover the pot and continue simmering until most of the liquid has been absorbed or reduced, and additional 2–5 minutes. Stir frequently, scraping the bottom of the pan with a wooden spoon. If you still have a lot of liquid left, use a quick cornstarch slurry to thicken it up (see the recipe notes for more). Remove the pot from the heat and mix in the Maggi seasoning sauce and mustard. To serve, I grind a bunch more black pepper over my bowl. With regular stroganoff, I like a sprinkling of Parmesan cheese—but since we’re going vegan here, we’ll sub in nutritional yeast. Scatter chopped fresh herbs like chives or flat-leaf parsley over the top and enjoy! #CookBlogShare, a great food blogger recipe-share guest-hosted this week at Casa Costello. 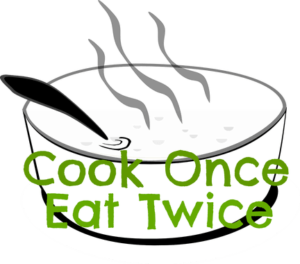 #CookOnceEatTwice, for recipes that are just as good left-over as they are when you made them, hosted by Searching for Spice. The What’s For Dinner Sunday Linkup at The Lazy Gastronome. Delicious Dishes Recipe Party, a weekly link party where bloggers share their most delicious recipes and check out other bloggers’ amazing recipes, hosted by Walking on Sunshine. 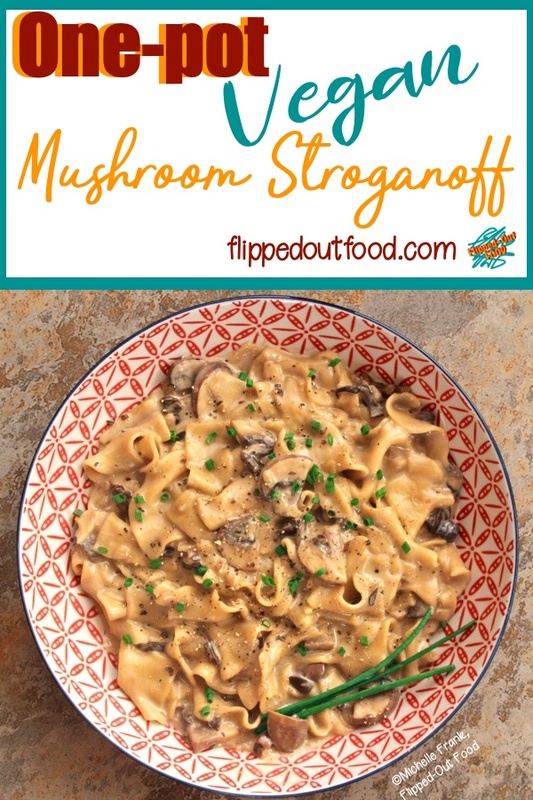 One-Pot Vegan Mushroom Stroganoff is pure, creamy comfort food deliciousness. The meal is done in less than 30 minutes (but plan ahead because you do have to allow 45 minutes to rehydrate mushrooms, which can be done in advance). Dairy-free and easily adapted to gluten-free. Heat the oil in a heavy-bottomed pot or skillet over medium heat. Add the cremini mushrooms and shallots. Sauté until the shallots are translucent and softened, 5–7 minutes. Add the rehydrated mushrooms, thyme, black pepper, and salt. Sauté for one minute. Add the pasta and the vegetable broth. Bring to a boil, then reduce the heat and simmer, covered, for 10 minutes, stirring occasionally. Uncover the pot and continue simmering until most of the liquid has been absorbed or reduced, and additional 2–5 minutes (see Recipe Note #5). Stir frequently, scraping the bottom of the pan with a wooden spoon. Remove from the heat and mix in the Maggi seasoning sauce, mustard, and sour cream (see Recipe Note #7). Taste for seasoning, adjusting if necessary. Serve immediately, sprinkled with fresh chives or parsley, nutritional yeast (if using), and more freshly ground black pepper. I like to use extra-virgin olive oil infused with porcini mushrooms. You could also use white truffle oil—or just regular extra-virgin olive oil. If you're cooking oil free, brown the cremini mushrooms for 1–2 minutes in the dry pot, stirring frequently, and then add the shallots with 1/4 cup of vegetable broth (in addition to the broth in the ingredients list). Sauté until soft. My favorite dried mushrooms for this recipe are porcinis, chanterelles, and shiitakes. Wood ear mushrooms also work well. Rehydrate the mushrooms by soaking them for ~45 minutes in 4 1/2 cups of very hot water. Remove the rehydrated mushrooms and run the rehydrating liquid through a sieve lined with paper toweling. Reserve. Rinse the mushrooms and pick out any tough bits (like stems). Chop the rest finely. You can rehydrate the mushrooms a day in advance. Simply keep the liquid and rehydrated mushrooms refrigerated (in separate containers). I use as much of the rehydrating liquid as possible for this dish: if I don't quite have 4 cups, I make up the difference with water or a bit of vegetable broth. I like egg-free wide dumplings, but any wide, flat pasta will do. Obviously, use a gluten-free pasta if you have that dietary restriction. NOTE ON CONSISTENCY: if you have a lot of liquid left (e.g., more than I show in #4 in the collage above), you can mix 1 tbsp of cornstarch with 1 tbsp of cold water to form a slurry. Mix this into the simmering sauce and pasta: the sauce should thicken right up. Keep in mind that the pasta will absorb much of the sauce as it stands. If you have leftovers, just add a little more vegetable broth as needed to loosen it up. If needed, mix in another 1/2 tbsp of sour cream. For a gluten-free substitute, use 1/2 tsp of tamari. You can easily make your own vegan sour cream, though you do have to plan ahead. Here's an easy recipe from Cookie and Kate. If you're not following a vegan or dairy-free diet, use regular sour cream. Because I'm so used to cooking with regular sour cream, I always temper it first (whether vegan or not). You can do this by mixing a small amount of the hot liquid with the sour cream in a small bowl. DEFINITELY do this if you're using regular sour cream, or it will curdle when you add it to the hot pasta. Nutritional yeast is a protein-rich vegan substitute for Parmesan and other cheeses you'd use to sprinkle on pasta. Sprinkle ~2 tsp over individual servings. This looks really tasty and creamy! So good that it’s vegan although I haven’t attempted veganuary yet. One day maybe. Thanks for sharing with #CookOnceEatTwice!